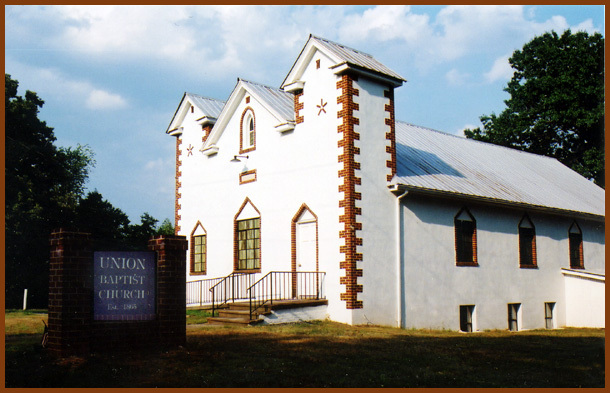 Comments: Union Baptist Church is the oldest African-American congregation in the Scottsville area and was organized in 1865 by the Reverends Henry Smith and John A. Doll. Located on Hardware Street, this church was designed by Rev. Houston Perry and constructed by Perry and John Dickerson of nearby Columbia, VA. The building was completed in 1954 and replaced the congregation's smaller, woodframe church further down the hill near the church's cemetery (just south of the current Union Baptist Church on Hardware Street). Directions to Union Baptist Church Cemetery from Scottsville Museum: Go West on Main Street and turn right on Valley Street. Just after you pass Warren Street on your left, veer to the right onto Hardware Street. Continue on Hardware Street for about one mile. Union Baptist Church will be on the right side of the street; just southwest of the church is Union Baptist Church Cemetery on the right side of the Hardware Street. Following is a July 2007 listing of the extant gravestones at Union Baptist Church Cemetery as prepared by Rob Manoso, an intern at Scottsville Museum from the Institute for Public History at the University of Virginia. Women are listed by their married names. Also, asterisks (*) that appear before names denote veterans. In 2007, approximately twelve graves are marked with stones or temporary markers whose inscriptions are now illegible. In 2017, information from four additional gravestones or temporary markers were added to the listing below, and the latest gravestone in the cemetery is dated 2015. Following the list of extant gravestones at Union Baptist Chiurch is another list that contains information from official certificates of death for the Commonwealth of Virginia of individuals whose place of burial is listed as Union Baptist Church. Copies of these death certificates were provided to Scottsville Museum by Lenora McQueen, who has conducted extensive research on her family in Scottsville and Albemarle County, VA. Thank you so much, Lenora! 1867-1920; see also death certificate information below. 1872-1947; see also death certificate information below. Burial Location: Willie Coles' death certificate said that she was buried in Scottsville, VA, but did not provide the cemetery's name. Given her husband, Silas Coles is buried at Union Baptist Church cemetery, it is probable that Willie, his wife, is also buried at that cemetery.